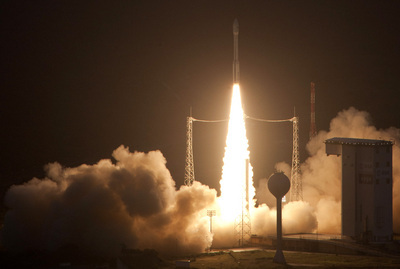 Launch of the European Space Agency's new Vega rocket. The European Space Agency's new launch vehicle, the Vega, made its first operational launch in mid-Feburary, carrying into orbit eight student-built amateur radio satellites and the LARES Laser Relativity Satellite. The ARRL Letter reports that the ham-band satellites were built by students in six different countries and will transmit telemetry on VHF, UHF and microwave amateur bands. One, PW-Sat from Poland, includes a voice repeater which will listen on 70 centimeters and transmit on 2 meters.